Having been founded in 1999, Bwin have gone on to achieve great things within the betting industry, with their sportsbook now one of the most popular online. Previously known as ‘Bet and Win’, the company was taken over in 2001, where today’s name was introduced. Registered in Gibraltar, Bwin operates under a license from the UK Gambling Commission, with the company also being registered on the London Stock Exchange. Bwin have held long associations with many sports teams, including formally being the main sponsor of the Portuguese football league, as well as sponsoring major teams including Real Madrid, Juventus, Manchester United and Barcelona. Bwin also hold major associations in the world of motor racing, basketball and tennis. Bwin have over 1500 members of staff working for them, helping to maintain and improve upon their 20 million users worldwide. Bwin have achieved such levels of growth largely thanks to their competitive odds and range of markets, as well as their live-streaming capabilities. This review will take an in-depth look at their sportsbook, discussing their in-play betting, customer service and mobile app, among other areas. Along with a varied sportsbook, they give you a choice of options for each event, so you can go for more than one outcome if that’s what you enjoy. The odds tend to be competitive and attention to detail has gone into designing the platform, making it simple to place bets, monitor the action, and browse for promotions right from the start. Many bookmakers offer a variety of sports in which their customers can bet on, however at Bwin, there is a truly enormous number available. With 30 sports to choose from, ranging popular markets such as football and tennis to more uncommon markets including handball and beach volleyball. While the number of available bets will of course depend on the popularity of the sport, however the number of markets is improving at a rapid rate at Bwin. With over 30,000 daily bets available, you are certainly never going to be short of options at Bwin. When it comes to odds, Bwin offerings are somewhat disappointing in comparison to some of their competitors. Despite this, customers who place bets early will actually often get a better deal, with early odds regularly set high, before lowering as it gets closer to the time of the particular event. With competitions such as golf majors, tennis grand slams and football World Cup’s available to bet on months in advance, it often pays to place bets early at Bwin. Although odds are a little on the low side, profit margins still tend to be appealing, with other areas of their sportsbook also helping to balance things out. 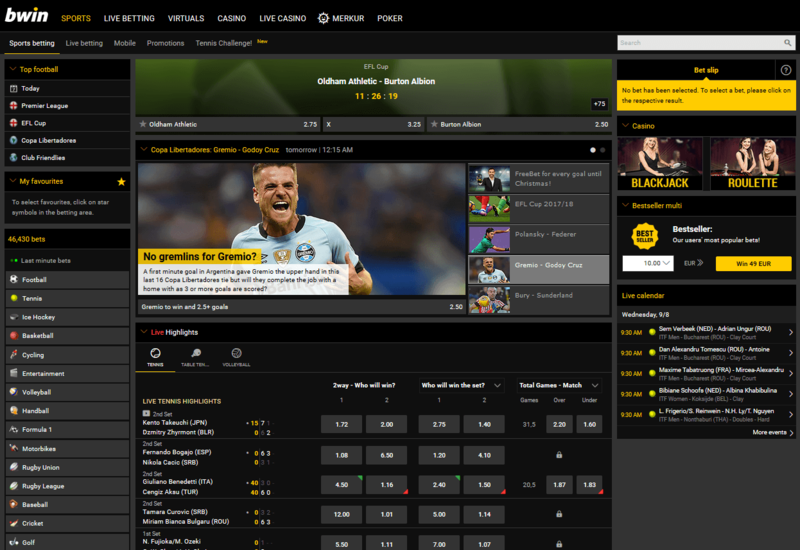 Despite perhaps not being one of the most visually pleasing sportsbooks around, Bwin’s website is very easy to use, with the interface also making navigating between different pages an efficient process. A black interface, coupled with both yellow and white features, ensure that different services and features are eye-catching and easily separated. However, with a large number of high-quality graphics, the Bwin website can run a little on the slow side for some customers, with features such as live-streaming and customer support taking more time to load. A bet slip, displaying all selections, odds and potential returns is constantly active on the right-hand side of the page, while the left-hand side is dominated by the different sports markets on offer. The centre of the page features current in-play markets that are available to bet upon, as well as upcoming matches and events. Bwin also offer customers an effective mobile app, which has a very similar feel to it as found on the main desktop site. As previously mentioned, the Bwin mobile app ensures that customers never have to miss out on opportunities to win when away from their computer. Available to both Android and iOS users, the app is free to download, with all of the same features as found on the desktop site still being available, including live-streaming and the depositing and withdrawing of money from your account. Elsewhere on the app, customers are free to use the ‘Betfinder’ feature, which allows users to quickly locate their favourite sports markets. Another positive feature available on the Bwin mobile app is the ability to accept odds changes, allowing you to accept higher odds if they get increased as you place your bet. The ‘PROTEKTOR’ feature helps to ensure your stake against a certain portion of lost bets is also another draw of using the app. Bwin are certainly a dedicated sportsbook when it comes to providing a wide variety of in-play betting markets, which as we all known only enhances the experience. There are plenty of live-betting markets to select from, with a range of stats available to view in a bid to aid your betting success levels. Customers can also switch between the event view and a regular view, allowing you to keep up-to-date with your selected matches, as well as other events. 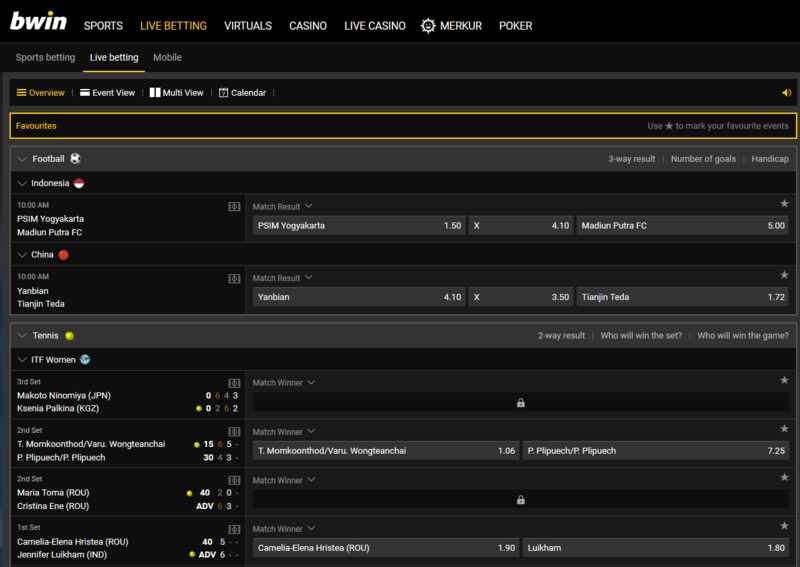 Such attention to detail suggests that they have put a lot of time and effort into this area of their sportsbook. 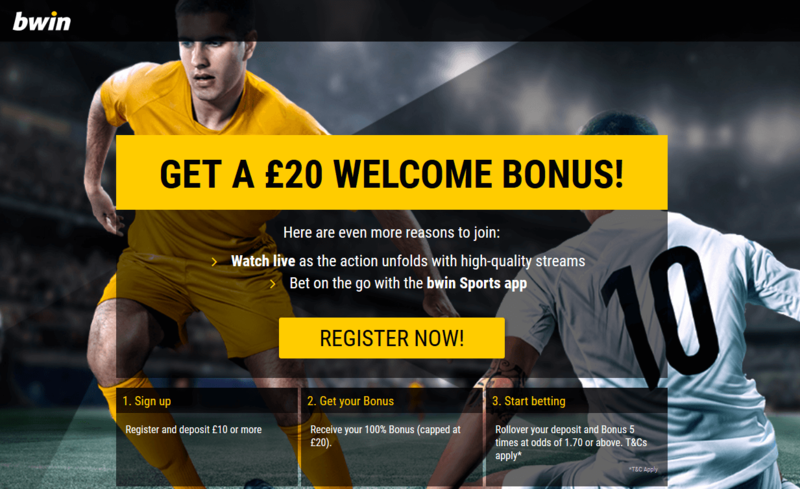 Bwin’s live-streaming options are undoubtedly one of their major selling points when it comes to attracting new customers, helping to compensate for their disappointing prices on offer. European football features heavily at Bwin, with dozens of matches available to watch throughout the week from a range of different countries. Users must have a minimum of £1 in their account in order to utilise this fantastic service, with tennis and American sports featuring heavily. The ability to both bet on and view high-quality sports action is appealing to many punters, allowing them to quickly take advantage of in-game changes. With streams of the highest quality, as well as often having accompanying commentary, Bwin’s live-streaming service is second to none. Daily live-streaming schedules are available for customers to plan their viewing, with live-betting markets easily accessible from these pages. In terms of bonuses and promotions for both new and existing customers, Bwin also score highly in this review. Upon registering at Bwin, the bookmaker welcome you with a £10 backup bet. As usual with welcome offers, some terms and conditions must be met before withdrawing any winnings made off this money, however it is certainly worth taking advantage of. As well as this offer, Bwin provide many ongoing promotions for customers to take advantage of, helping to ensure that customers remain loyal to the sportsbook. Free bets, loyalty bonuses and enhanced odds are just some examples of the promotions available at Bwin, with major competitions from the world of football, horse racing and tennis regularly receiving such offers. FreeBet Mania – For punters who just can’t get enough of the number of bets available at Bwin, this promotion is right up your street. Users are required to place as many single or multiple bets with odds of 2.50 or higher, with Bwin granting free bets of up to £50 every day. The reward received reflects your betting activity, with up to ten £20 bets resulting in a £1 free bet. Although this may not seem like a significant amount, upon reflection, for those who wager large volumes of cash, this can become an extremely rewarding promotion. Super Sunday Combi – For football fans, this promotion is somewhat of a treat. With many punters often reflecting upon how unlucky they were to lose out on an accumulator win as a result of just one single selection, Bwin finally have the perfect answer. Simply place an accumulator bet of 5 or more matches, and if one of your events lets you down, you will receive an automatic refund on your bet, up to a maximum amount of £50. 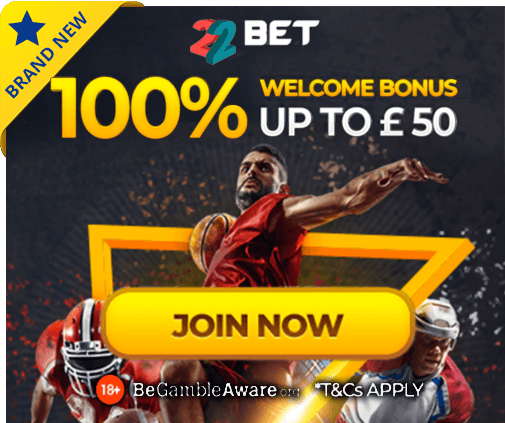 Saturday Goal Bonanza – Despite Bwin not using promo codes, this does not mean that users do not receive free bets every now and then. Saturday is undoubtedly the biggest day of the week when it comes to betting, with football the standout sport. As a result, for each goal that is scored in a match that you have placed a bet on the half time/full time markets, you will get a free bet of £2. With the ability to cash out bets having become increasingly popular among the major bookmakers in recent years, Bwin have ensured that they do not fall behind in this area by adding the feature to their site and mobile app. Early pay-outs are perfect for those punters who are uncertain of the success of a bet, with all types of bets available to cash out, before the end of all selections. Cashing out a bet increases the likelihood of seeing your entire pot disappear, with customers able to monitor their bet, before cashing out at a point in which they are happy with. You can still choose to wait until all matches are finished if you are confident in their chances of success, with nothing sweeter than picking a winning football accumulator or first-placed horse. Customer support and help is becoming increasingly more important to customers when making a decision as to which bookmaker to register with. Given the size of organisation that Bwin has become over the years, their customer service features are somewhat of a disappointment. A lack of live chat service, something that has become extremely popular among punters, as well as Bwin members of staff not being available on a 24/7 basis, mean that this sportsbook is not as effective as some of their rivals when it comes to dealing with problems and issues revolved around wagering. Customers are able to make contact via both email and telephone, with phone lines available between 10:00-22:00. Despite their downfalls in this area, response times for customers are generally very quick. Thanks to one of the most sophisticated and technologically advanced security systems around, customers at Bwin can rest assured that their platform is a safe environment in which to use. Bwin review their security protocols on a regular basis in order to ensure that any customer information and details are never made available to any third-parties, with a 128-bit SSL encryption, provided by Tech Labs, only providing more security. Bwin have also recently teamed up with the European Gaming & Betting Association in order to create the European Sports Security Association, which bids to ensure that insider bets and betting fraud is kept to a minimum. As with any bookmaker, only those aged over the age of 18 are free to register with Bwin. Despite not being one of the most consistent bookmakers around today, Bwin certainly achieve great success thanks to some of their better services and features. Live-betting has added a significant amount to the Bwin sportsbook since its introduction, with live-streaming capabilities also adding to the options available to both new and existing customers. Bwin have not looked back since this time, with their modern looking sportsbook and mobile app helping to ensure that betting on their platform is an enjoyable and stress-free experience. Their range of sports markets is also an area in which they excel, with any customer certain to find something to suit their needs. Although Bwin currently restricts customers based in certain areas, including those in the US as a result of local laws, those that are free to take advantage of their sportsbook are greeted by an ever-improving set of odds, knowledgeable and efficient customer service team and detailed features.